This is great. If your kid LOVES to play with flashlights then they'll love this! It's got a great price point and it's a ton of fun. I came across these at the Toy Showcase this year and probably laughed for 10 minutes. Besides. It teaches your kids to really know about poop! And if they love dinosaurs-it's a total WIN/WIN! 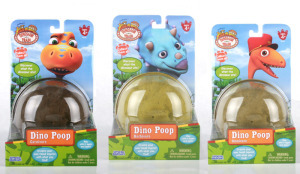 Here is some more great info about the dino poop! 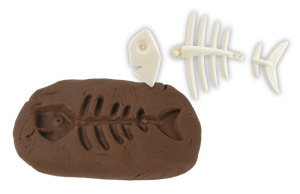 Get some Dino Poop for about $10. 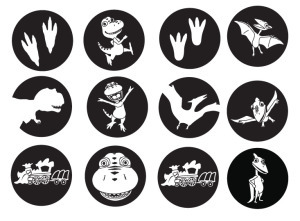 Uncle Milton has come up with some super fun goodies with the characters from Dinosaur Train. They actually sent us some. And it was a lot of fun to watch them hatch. It took a few days to totally hatch but it was the first thing Boston looked at when he came downstairs in the morning. Easy to hatch! 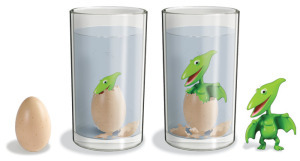 Just place the egg in water. They have a great price too. Great birthday gift idea. About $10.